I have made lots and lots of flash cards, printing them out on the computer in bold, large letters, then laminating them, so that they are not spoiled by spillages and if they are bent, they just bounce back! I make two of each, since Galina learns to read by matching, picture to picture, then word to picture (or object), picture to word, then word to the word, and finally she can read the word on its own. Matching is the basis for her reading, and indeed for so much learning. In common with many young children, Galina enjoys posting things, so we have incorporated posting the flashcards as part of our reading. We made a post-box from a cardboard shoe box, painting it bright red, and then sponge-printed golden butterflies all over it (Galina’s idea). Once Galina knows the words well, a puppet (manipulated by me) holds up the flash cards, one at a time. Galina calls out each word, takes it from the puppet, and then posts it. It is very important not to confuse teaching with testing - a process of errorless learning must be developed, so that the child is enjoying the process, and cannot fail. The child must not feel he or she has to perform. We know from research that children and adults with Down’s Syndrome are very susceptible to a sense of failure. They tend to develop an increasing use of avoidance strategies to get round doing something they don’t want to do. Situations where low expectations and constant testing of aptitude prevail will hardly be conducive to maximising anyone’s potential. Having learned to read the individual words, Galina and I read the sentence we've signed. Galina can now read the individual words in isolation and, also, combined in sentence form, pointing to each word from left to right, for example "The baby is crying." "Don't cry, baby." "The baby is walking." "The baby is sleeping." "The rabbit is eating,". It is fascinating to note that articulation improves dramatically when Galina reads, rather than simply spontaneously speaking the words: e.g. for some time Galina had been saying “dow” for ‘window’, pronouncing only the last syllable (which is typical of a child with Down’s Syndrome - short-term memory is often a problem, resulting in the child retaining only the last syllable). However, when she saw the word written down for the first time and I said: “window”, she immediately said: “dindow”, and only days later, having learned to recognise the written word, she said: “window.” This process has occurred repeatedly. For ages, Galina was saying “moo” for “moon”, but as soon as she learned to recognise the written word, she articulated the final consonant. Reading is a hugely helpful tool in achieving clarity of articulation as well as in building grammar. I notice that Galina is also applying singulars and plurals correctly. Sometimes we’ll practise plurals during our reading sessions. For example, I will hold up a flash card saying 'arm', placing it on my arm, then I say “arm” again. Next I hold up another example of the same card and say "another arm", then I hold up a third flash card which says 'arms', and say "two armS", stressing the letter 'S'. Then I cover up the 'S', and say: "Look! It's the same now! Arm - oh-oh, the 'S' is hiding! Where's it gone?!" Then I make the 'S' reappear: "Boo! There's 'S'! Now it's NOT the same! It's ‘armS’ now! ‘armS’!" Galina got the hang of this very quickly with all the double body parts: ears, eyes, legs etc. She is sight-reading many words and short sentences consistently and is beginning to learn the alphabet. She demonstrates great interest in the letters within the words we are reading. For example, she will comment, pointing to a letter ‘l’ appearing in the middle of a word: “Long tree!” drawing her finger along the length of the letter ‘l’; or she will say: “circles, round circles” pointing to the double letter ‘o’ in the middle of ‘doors’, or ‘book.’ So, she is beginning to develop an awareness of the combination of letters which make up words. Again, through Downs Ed, I ordered a wonderful book: Teaching Reading To Children With Down Syndrome . This is written in a superbly accessible style for parents, and is a simple step-by-step approach, thoughtful, caring, child-centred and it works! There is much that I have read about Down syndrome which encourages parents and professionals to employ visual materials as much as possible in the development of our children. There is no doubt that this is very important but by implication, this can suggest that children with Down syndrome are not auditory learners – indeed, I’ve read that this area is not one of their strengths. Certainly, it is true that among children with Down syndrome there is a greater likelihood of hearing problems. But, in Galina’s case, she is very responsive to audio tapes. I think it’s important not to assume that, just because the child has Down syndrome, he/she will respond in certain ways. Making assumptions can close doors. I worked, at one point, in the BBC Radio Scotland Education Department, producing programmes for children of various ages. I still have copies of the Hopscotch programmes that I produced for nursery and primary school children, aimed at four to six year olds. Each programme is in three five-minute sections: the Song Box, the Story Box, and the Sounds Box. A character presents the programme - sometimes a straightforward presenter, and sometimes a character like the Puddock, (a frog), or the Moudie (a mole). Galina adores these tapes and listens to them again and again. She can repeat huge chunks of them along with the tape. I’m told that before the average child can speak a word, he or she has to have heard it spoken at least two thousand times. Repetition is crucial. I feel that the added strength of the audio tapes is that the listener is creating his or her own imaginary pictures, thereby exercising cognitive skills. more and more golden words for us to grow. Through the Learning Development Aid catalogue I also ordered a large puppet, whose advertised name is Molly . She has a wonderfully expressive face with a mouth and tongue that can be manipulated, and gloved hands, which can be used to sign. Galina enjoys her very much, and Molly adds variety and fun to our learning. Molly is a great bonus, because she becomes a participant, which means we can practice turn-taking - such an important social skill. Also, Molly can get things wrong, and then Galina has to help her. If Galina gets fed up, Molly can take over - there are endless possibilities here! Downs Ed has also produced a large folder entitled Down syndrome: Issues and Information, covering all aspects of development of children with Down syndrome, divided into different age-groups. I ordered the 0-5 years folder. This is a really valuable source of information, well presented and accessible. 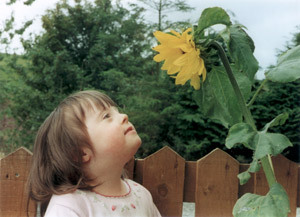 During a period in the Sick Children’s Hospital, in Edinburgh, when Galina had pneumonia, I made contact with a paediatrician, who is involved with Down’s Syndrome Scotland . She suggested that my husband and I might be interested in the Hanen Program, a course for parents whose children have speech delay and learning difficulties . We enrolled for this course, (which was free) and were part of a group of a dozen or so parents who met on Tuesday evenings over a period of three months at the Sick Children’s Hospital. Some sessions were replaced by home visits, when, while playing with Galina, my husband and I were video recorded by the Hanen speech therapist who was assigned to us. Edited sections of the video would be shown at the next group meeting. The emphasis was always on the positive, so the course was highly motivating. It was valuable to share experiences with other parents and to come away with new ideas to work on with Galina before the next meeting. This is a Canadian programme, and is a subtle, detailed analysis of adult-child communication. 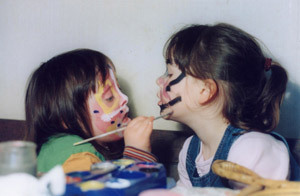 The accompanying book, which is full of very thought-provoking, child-centred and practical ideas, often in the form of games, is entitled It Takes Two To Talk . The Hanen organisation also runs a programme for parents whose children have Autistic Spectrum Disorder and training in Speech and Language Therapy. At this point, Galina was 3 years and 8 months. She was speaking in two and three-word phrases, and occasionally in four and five word sentences. She was also beginning to use different tenses. “Gana (her name for herself) jumped off Daddy’s arm,” was a new utterance we heard, when her Dad lifted her from her high chair to the floor. She has been using this little sentence, adapting it in a variety of ways since then. She uses words of several syllables e.g: butterfly, caterpillar. We find the technique of clapping out syllables effective, e.g. “bu-tter-fly,” (three claps) “win-dow,” (two claps). Galina’s father, a native Gaelic speaker from Skye, speaks in Gaelic to Galina and her brother Rob at all times. Galina understands Gaelic very well, and is what is termed “passively bilingual;” i.e. because her environment is predominantly English-speaking and her father speaks virtually the only Gaelic she hears, she tends to reply in English. She never confuses Gaelic and English, when she does occasionally reply to her Dad in Gaelic. Today Galina said to herself as she was building Duplo bricks: “Gana building tower high up - suas ard,” i.e. she repeated the last two English words of her mini-sentence in Gaelic: “high up - suas ard.” so she appears to be aware of the concept of translation. Her brother Rob went through Gaelic medium education at primary school, when we lived in Edinburgh, and is now fluently bilingual in Gaelic and English. Since Galina has started to speak, she has begun to play and interact with the other children at nursery and playgroup. She is well integrated and accepted wholeheartedly by her peers. Obviously Galina develops much more slowly than many children, and she will always have learning difficulties, but she is undoubtedly developing steadily. And, of course, the work continues! Any ideas are most welcome - the sharing of experiences is one of the most helpful and stimulating aspects of this journey we’re on. I wrote the above article two years ago. The good news is that within the last 18 months, our local authority has run classes in signing for teachers, auxiliaries and parents, and Symbol UK has been employed in our area. Galina is now 5 years and 9 months. She has an extensive vocabulary. There’s no doubt that it often takes her longer than her peers to process information, and therefore conversation with Galina is not fast. It is essential to give her time – as we learned on the Hanen Program: Observe, Wait, Listen. On the whole, she speaks in full, well constructed sentences. “My Daddy’s gone to the Country Store to buy Wallace and Grommet cheese, called Wensleydale,” she said yesterday – although getting the Wensleydale out caused a few splutters! Occasionally, she will relapse into utterances such as “Mummy – ice cream!” but she can tell me about anything that has happened, and can express her needs eloquently. She can also express abstract thought. A couple of months ago, she was settling down to watch her Pinocchio video. The titles were going up, accompanied by that strangely memorable high-pitched male voice singing “When You Wish Upon A Star.” Galina asked me, “Mummy, who’s singing?” “I don’t know,” I replied. “I think it’s Pinnocchio’s father,” she said and indeed, it is Geppetto who, in the story, wishes upon a star. At present, Galina’s favourite game is to play with me and her Jungle Book cuddly animals. “Come on, Mummy. We can make them talk. I’m Mowgli.” Drama is such a liberating, creative way of learning to communicate. Galina’s current and excellent NHS speech and language therapist , the fourth, has willingly worked with our Symbol UK target plan, updated by the Symbol UK therapist on a second visit. She is delighted with Galina's development - both speech and social skills, and sees huge progress since the summer holidays, when Galina attended a daily group speech and language therapy programme for one week. Galina is always invited to her classmates’ parties. I make a point of inviting her friends to play at our house, and occasionally the compliment is reciprocated. It’s true that the social side of her life requires some conscious engineering on my part – other parents are perhaps a little unsure of what to expect initially. I was, however, greatly encouraged to hear from her class teacher, at the recent parents’ evening, that a number of parents had commented on how much their children enjoy having Galina in their class. There was a suggestion last year that she should repeat a year at the school nursery. I’m glad to say that the senior educational psychologist wisely advised us to send her into Primary 1 along with her peers. Her wonderful class teacher put in a huge amount of work, outside school hours, to prepare for Galina’s entrance into Primary 1. Among other material, I have supplied her with Stephanie Lorenz’s invaluable publications on inclusion [14 for example], and the inspiring book Working with Hannah . We are very aware of the potential pitfalls: communication difficulties can lead to anti-social behaviour, and Galina’s frustration has sometimes resulted in shoving and occasionally spitting. It seems that there is little training in inclusion, and its success or failure often depends on the commitment and openness of individual teachers. Anti-social behaviour can be exacerbated by uninformed, untrained staff having low expectations of children with learning difficulties. Galina has two excellent auxiliaries who work with the class teacher as a team, maximising her opportunities to participate and learn within her peer group. She is not relegated to the corner, sitting on the auxiliary’s knee. The class teacher has communicated to me how interesting she’s finding the process of including Galina, and that much of the material I have given her to read is actually very useful to all of the children in the class. As part of the local school reading programme, Galina and her classmates are working their way through a sound system similar to the Downs Ed Sound Cards, although the signs that accompany the letter sounds are quite different. I wondered whether this would confuse Galina, but decided to take a ‘wait and see approach.’ In fact, she has no difficulty in learning another parallel set of signs for the same sounds. She is very aware that there are different ways of communicating – English, Gaelic and various modes of signing. “Mummy says ‘badger,’ and Daddy says ‘broc.’ Daddy speaks Gaelic. Daddy reads me Gaelic books. You can’t read Gaelic books, Mummy. Only Daddy,” she told me recently. Actually, I can read a good bit of Gaelic, thank you, Galina! Galina is continuing to read with enormous enthusiasm. She enjoys painting, is very good at colouring in, and is attempting to write. I use drama as much as possible as a motivating tool. Galina loves to dress up as Postman Pat. She writes the names of her favourite characters on envelopes, tracing over the dots I have already marked, which form the shape of each word. She finds it very difficult, as yet, to form most of the letters of the alphabet spontaneously herself, but is beginning to trace words very competently. The envelopes go into her postbag, and then, as Postman Pat, she goes around our house, knocking on doors, which I open (in character – just to keep my hand in as an actor between jobs!). Postman Pat reads the name and delivers the post to Miss Hubbard, Ted Glen, Peter Pan, Geppetto, Baloo – there seems to be no difficulty delivering post to different worlds – Greendale and Neverland in the same day! The latest development at school is that Primary 1 has adopted Numicon which is proving to be a very effective numeracy system for many of Galina’s class-mates. It’s encouraging to know that inclusion can be a two-way process. We continue with Yoga, and a friend of mine does Cranio-sacral treatment and massage with Galina, which, being very tactile, she adores. I have been working on ‘left’ and ‘right’ with her, using feathers, stroking her left ear, then right ear, left cheek, right cheek, left leg, right leg. I ask her to raise the arm or leg I’m touching with the feather, or feathers – sometimes I hold one in each hand, touching opposite sides simultaneously. She can now raise the left arm and right leg, or indeed any combination of limbs, as soon as she feels the feathers’ touch. This game developed from Galina herself, when she found a feather in the woods, and asked me to stand still, while she stroked my face with it – a magical moment. 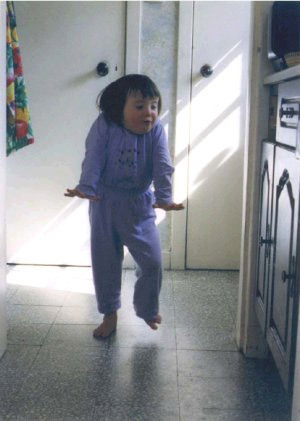 Many things have been said about people who have Down syndrome. see Galina's signed and spoken vocabulary, aged 3 years. Buckley, S. Emslie, M. Haslegrove. G. and Le Provost, P. (19XX) The development of language and reading skills in children with Down syndrome Portsmouth, U.K. The Down Syndrome Educational Trust. The Signalong Group, enquiries to The Signalong Group, Stratford House, Waterside Court, Rochester, Kent ME2 4NZ telephone 0845 450 8422 website: www.signalong.org.uk . 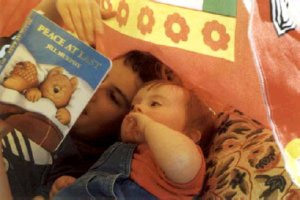 Olwein, P. L. (1995) Teaching Reading To Children With Down Syndrome Woodbine House. Available from The Down Syndrome Education Trust. Down’s Syndrome Scotland, 158/160 Balgreen Road, Edinburgh, EH11 3AU. Tel: 0131-313-4225, fax: 0131-313-4285. Wise, L. and Glass, C. (2000) Working with Hannah: A special girl in a mainstream school, Routledge Falmer. Available from The Down Syndrome Education Trust. Lorenz, S. (2002) First steps in inclusion – A handbook for parents, teachers, governors and LEAs, David Fulton. Available from The Down Syndrome Education Trust.